It removes makeup, does not sting eyes and does not dry skin. It has a soothing scent which feels nice but does not linger. It is not a one step cleanser. You have to wash your face with water after use. This can be used as a face wash as well. In fact, I am using it more as a face wash. It cleans without leaving behind a trace of oil without stripping away skin's natural moisture - just like it claims to do. Just to test, I even used it after using another face wash, and it still caused no dryness. Thanks to the glycerin, sorbitol, and the five flower extracts in it. I have zero complaints from this and I am utterly impressed by this. What more can you get from a Rs 245 face wash? Yes, you can. I discovered that it cleans makeup brushes perfectly because it attacks makeup but is gentle on the brush fibers. I do not have to spend any time to lather it up nor dilute. I can directly use the foam. When cleaning many brushes together, that also comes handy as well as a time saver. It is SLS and SLES free but contains PEG-7 Glyceryl Cocoate and Cocamidopropyl betaine as the surfactants. Both are coconut oil derived. 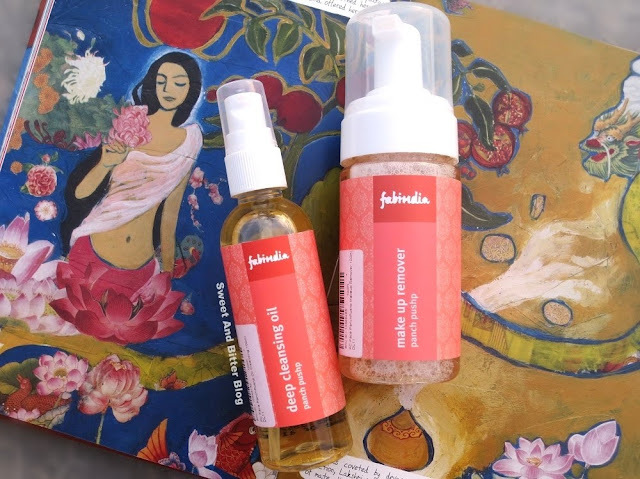 FabIndia Panch Pushp Deep Cleansing Oil (Rs 395 for 100ml): Remember how I went gaga over Forest Essentials Floral Makeup Remover last year? I even had a backup. But, unfortunately, I faced a terrible problem with it. I have updated the issue in the review as well. 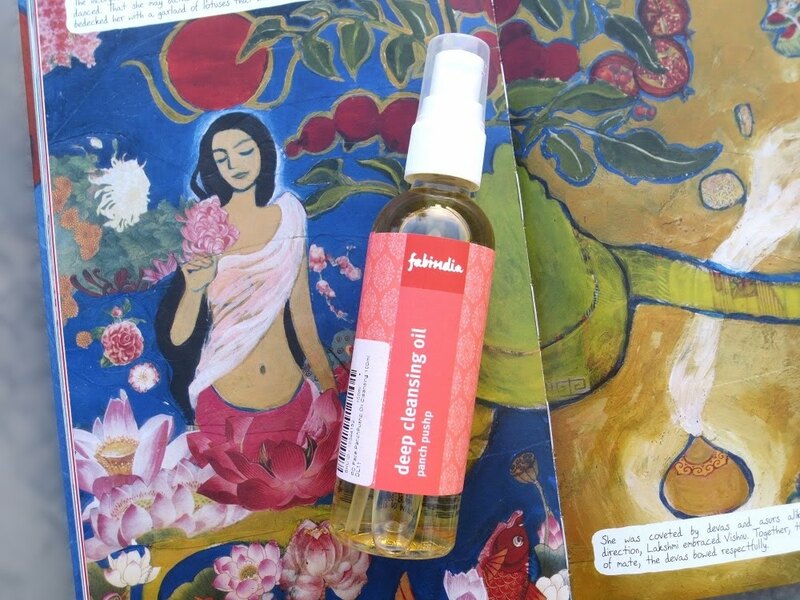 While I still love cleaning oils, there is no going back to that one. So, it made me happy when I found this. The oil makeup remover from FabInda has sunflower oil, sesame oil, and soya oil along with the oils of the five flowers mentioned above. It is light, removes makeup, can be used directly or with cotton, does not irritates eye nor does it feels heavy. But, you do need to wash it off with a face wash or water. 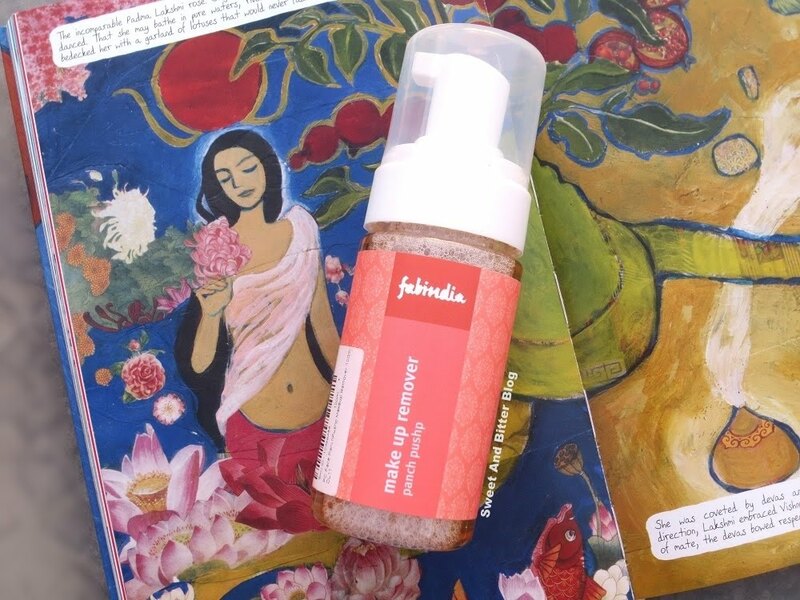 As you might have guessed, I use the FabIndia Makeup Remover. Overall: As I mentioned already, I love both of them. I highly recommend getting these, and I cannot choose one though they are for the same purpose. 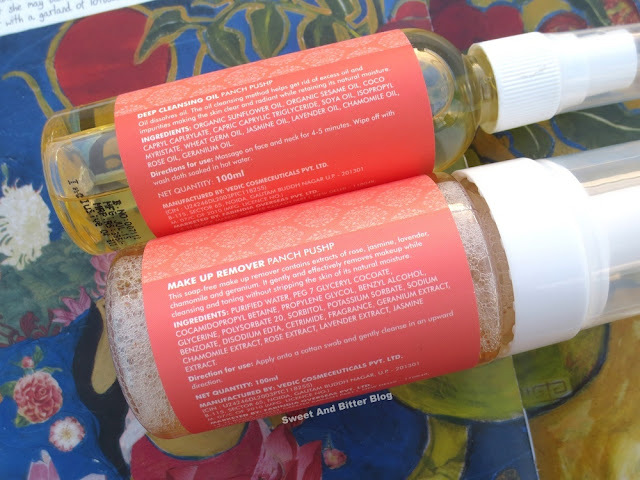 It is the same reason why I reviewed these two products together.